Contact your members and promote your unit and district events! 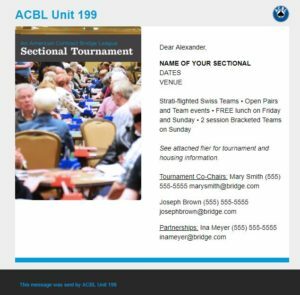 ACBL’s Email Services helps units and districts reach their members with the Marketing Solutions, powered by Pianola tool. To create an account, send a request to emailservices@acbl.org. Accounts are limited to unit/district officers and tournament chairs. In just a few steps, you can pick out an email design, choose your target audience and send the email. Ready to start reaching your members? Send a request to emailservices@acbl.org. You’ll receive a user guide and an invitation to create a username and password for your own personal account. Need help using Marketing Solutions (Pianola)? We have partnered with Baron Barclay for tech support. Simply contact Mary at 1-800-274-2221 or mary@baronbarclay.com. We also have a helpful “Pianola 101” webinar that takes you through every step. Each unit and district is categorized as a “sender,” and each sender has its own contact list. Members can choose to receive or unsubscribe from emails sent by any unit or district. This setting only applies to that particular unit or district. Unsubscribing from a unit, district or ACBL means the member will not receive any further emails from that entity. All emails must have a “reply-to” email address to be used for replies to the email. Units and districts have a default reply-to address that can be changed at any time. Users also have their email address available as options. To add or change reply-to addresses, contact Email Services. If you are unable to use the Marketing Solutions (Pianola) tool, you may continue to contact Email Services. for assistance in sending a tournament notice to members in your area. Emails will not be sent without a request. Requests should be sent at least six weeks ahead of time for processing. ACBL cannot guarantee timely delivery of any emails submitted after this deadline. Only one email per tournament will be sent by ACBL. Sectional tournament emails will be sent to members in a 200-mile radius, and regional tournament emails will be sent to members in a 500-mile radius. Tournament fliers will be attached to the email, and tournament chairs will be used as reply-to addresses unless otherwise requested.